We are created with our inner core which is our spirit. We fill our spirit with either God or things of the world. 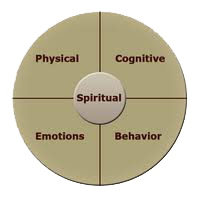 What we believe directly affects our thoughts, behaviors, emotions, and physiological reactions. By using leveling prayer techniques, and OEI, the inner core and core beliefs of the person change dramatically and impact the rest of the person. Counselling can be seen as a gentle process where the person can be set free from negative thinking to truth based positive thinking.